Shortly after 8:30 Sunday morning a little weather radar history was made in Arlington. 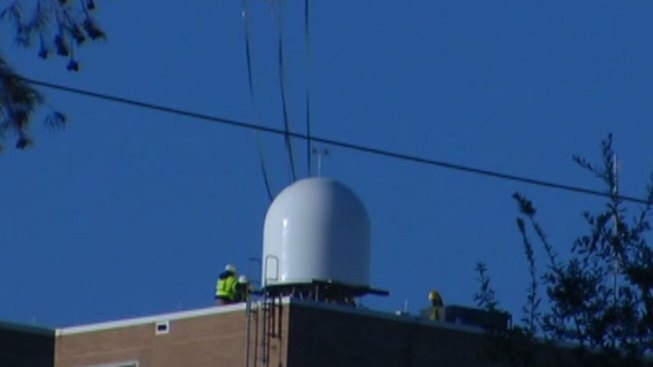 A helicopter lowered the fastest, most accurate radar system in the world on the roof of a building on the UT-Arlington campus. "This new radar's going to help us by being able to see storms a lot clearer," said Juan Ortiz, Emergency Management Coordinator for Fort Worth. "It's going to give us high resolution and faster scanning so we'll have more timely data. We're able to make better decisions that will enable us to safe lives and protect property." The radar system should be operational in a matter of days, but there are more to come in North Texas. "This is just one component of building capacity to where we're ahead of preparing, ahead of responding and ahead of recovering from any kind of emergency as a region," said Dallas Emergency Manager Kevin Oden. It's taken two years to get to this point as local governments worked with the weather service and the federal government (FEMA and the Department of Homeland Security) to secure funding. The radar equipment sat idle in a warehouse at DFW Airport even when those devastating tornadoes came through in April. "The fact is," said Oden, "we're here now and we've got a good solid plan and process laid out to continue the momentum moving forward and get this process up and running so we want to focus more on where we're going than where we have been." The system in Arlington only covers about 25 miles on its own. But once all of the Collaborative Adaptive Sensing of the Atmosphere (CASA) radar are scanning the skies around DFW, predictions of when bad weather will hit can be pinpointed to down to specific neighborhoods. "We've actually operated a similar system in Oklahoma the past four years, " said Brenda Phillips the Deputy Director of CASA who's based at the University of Massachusetts in Amherst. "We've seen that emergency managers have made some life-saving decisions based on the radar." The next CASA radar system is expected to be installed by the end of the year at the University of North Texas campus in Denton. The goal is two have two more up in Addison and Fort Worth by next spring but some grant money is pending on those two. A total of eight installations are planned as part of a five year, $10-million collaborative project for early storm warnings.